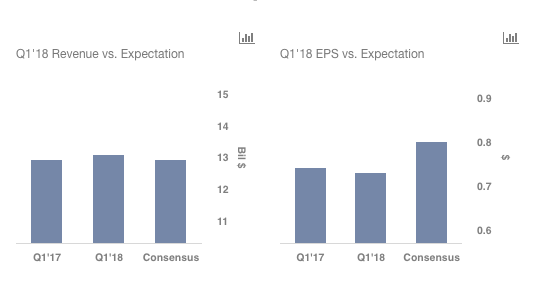 Anheuser-Busch InBev (NYSE:BUD) had a mixed first quarter, wherein it beat consensus estimates on revenue but missed on earnings. The revenue growth was led by markets such as Colombia, Western Europe, and Australia, as well as strong performance of the premium brands. BUD also managed to improve its EBITDA margins by 70 basis points, due to the premiumization and synergy benefits. However, higher taxes and mark-to-market losses related to the hedging of its share-based payment programs resulted in a fall in EPS by 1 cent, as compared to the prior year quarter. The company expects the growth to accelerate in the remainder of the year, as the marketing and sales expenditure is concentrated in the first half of the financial year. Moreover, the tax rate is expected to be between 24% and 26% for the full year, versus 28.3% in the first quarter. Consequently, the margin pressure should ease as the year progresses. 1. Softness in the U.S. Market: BUD has been witnessing a soft market in the U.S., made worse by the colder than normal weather in the quarter, with industry volume declines exacerbated by market share declines. The company estimates that industry Sales-to-Retailers (STRs) in the United States declined by 2.3% in Q1, while BUD’s STRs were down 3.3%. The company’s weak performance in the region was expected, as Molson Coors, which reported its first quarter earnings earlier this month, blamed “overall industry softness” in the U.S. beer industry for its sales decline. On the other hand, the company’s Above Premium brand portfolio had a strong quarter, gaining 80 bps of market share. This growth was led by Michelob Ultra, which reported double-digit volume growth, continuing its run as the top share gainer in the U.S. for the twelfth consecutive quarter. Looking ahead, while we expect the overall North American revenues to decline in 2017, its Above Premium segment should deliver strong growth. 2. FIFA World Cup Sponsorship: According to BrandZ, Budweiser is the most valuable beer brand in the world and the number-one global beer brand by volume. Budweiser is the global beer sponsor of the FIFA World Cup, which is going to be held in Russia this summer. Partnering with such a massive event, which boasts of an audience of over 3.2 billion, should bode well for the company. In this regard, AB InBev launched its biggest commercial campaign called “Light Up the FIFA World Cup.” This campaign is being activated in more than 50 countries, which includes not only those where the brand already has a significant presence such as China, Brazil, the U.K., and Russia. The new markets include Colombia, Peru, Ecuador, Australia, and Africa. However, the increased marketing spend, which is skewed towards the second quarter, should remain a drag on the margins. 5. Potential of China: Despite a tough comparison, revenue in the country grew by 4.4%, driven by volume growth of 1.6% and revenue per hl growth of 2.7%. The High End company recorded high double-digit volume growth, led by the strong performances of Corona, which became the number one imported beer, and Hoegaarden. Moreover, the e-commerce business had a stellar quarter, with high double-digit volume growth. The market share of the company continued its strong rise to over 20%, in an industry that underwent a modest recovery after a decline in 2017. The margins also improved, driven by premiumization and productivity gains. Looking ahead, the prospects of the company look positive in the country, as it occupies a place in the faster-growing premium and super-premium segments, as well as the online channels.